A Solar Hot Water Heater Can Provide Savings For Your Home! A Solar hot water heater uses the sunlight to heat your water and is highly efficient. 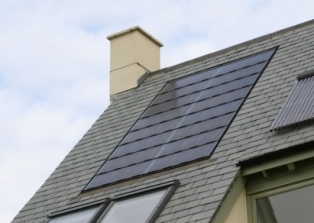 A solar water heating system can reduce the consumption of your typical hot water heating needs by about two thirds. These solar water heating systems appeared in the United States in the late 1890’s. The earliest type of passive solar water heater is called a batch system. This system is basically a black storage tank that is exposed to the sun. With the tank being black, it absorbs and retains more heat, making and keeping the water inside hotter. Solar water heating systems appear in many different configurations and are used for different applications, from heating water to very high temperatures for use in the home to heating swimming pools and space heating. The majority of these heating systems have two components. A solar collector (link to solar heating) and a storage tank. These solar water heaters use the sun to either heat the water or a heat transfer solution, that in turn heats the water in the solar collector. The heated water is kept in a storage tank, and is supplemented by your standard water heater. Active solar water heaters use pumps to circulate the water or heat transfer solution within the collector. These are the most common types of solar hot water heaters. A Passive solar water heater relies on gravity and the natural forces for water to circulate as it is heated. These systems have no electrical pumps and because of this are easier to maintain. In addition to the many benefits listed above, another great benefit of installing a solar water heater is that the US Energy Policy Act implemented a 30% tax credit for consumers who install a solar water heating systems. Return from Solar Hot Water Heater to Solar Heating page.